I have another fabulous review for you today. Memoria Press sent us their D'Aulaires' Greek Myths set and we've been having a blast working through it. D’Aulaires’ Book of Greek Myths - This is a physical book (soft bound). It includes beautiful illustrations and many stories. Covered are the major gods, minor gods, the creation of the gods and their mortal children. This is a pretty complete overview of all of the major players in Greek Mythology. 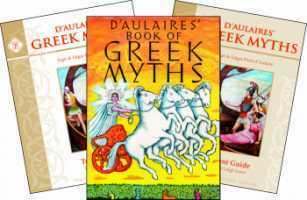 D’Aulaires’ Book of Greek Myths Student Guide - This soft bound book includes all the worksheets needed for the course. There are 25 lessons and 5 review lessons. 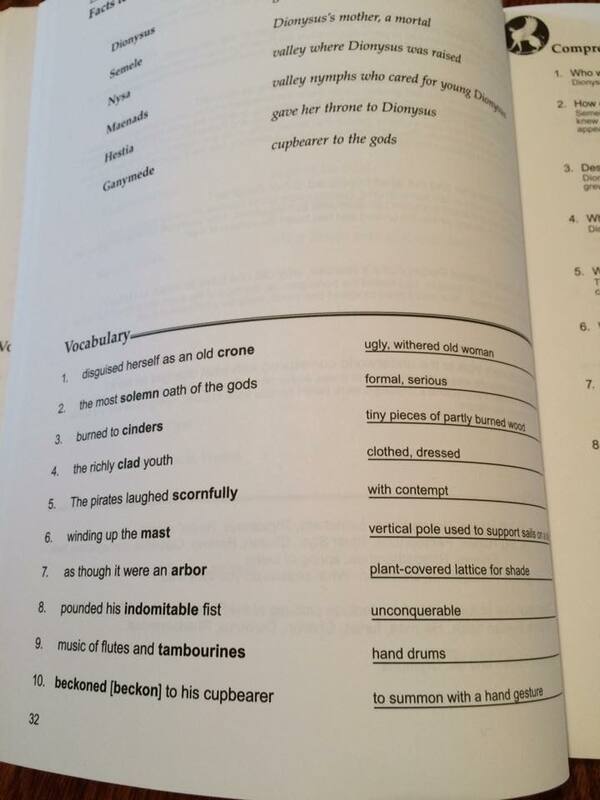 In the appendix you will find maps, pronunciation guide, Greek myth lists and 100 questions for Greek mythology. 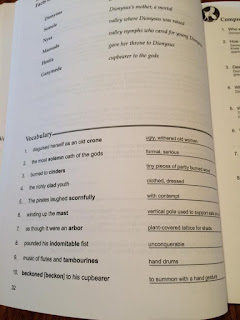 D’Aulaires’ Book of Greek Myths Teacher Guide - This book is soft bound and contains all the solutions for the workbook. Included is 5 test and a final exam. It also has helpful hints for teaching the course. In the beginning of the student text (and teacher's) there is a whole section on why teaching this subject is beneficial. I will tell you my point of view - we learn about past generations and what they believe by studying it. We also see how man makes every attempt to explain their world EXCEPT by believing is God. We have read through some of D'Aulaires' book in the past so I was excited to add more structured learning. My middle son (8th grade) was the primary learner in this review. The book is set up by lessons and so he did a lesson a week. There is no set schedule with this book (I wish MP would include a real schedule to work along with but with this course it is fairly easy to work that out on my own.) 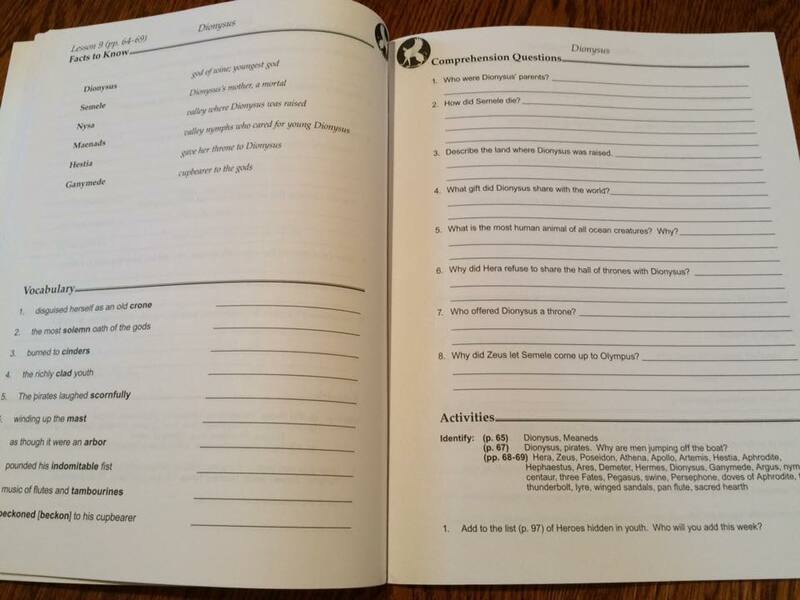 For us it worked well for Xander to read the sections and then work on the workbook. 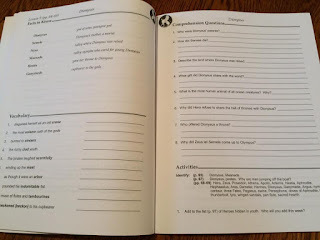 The activities included things like making family trees, map work, additional definitions, internet research (all things that could be done in a reasonable amount of school time). I think adding the Memoria Press activities really helped balance the learning for this subject. I love that vocabulary is included as my students don't really want to do vocab any more but having it in most of our subjects (math, science, history, literature) means we are still covering - just on the sly. This course could be used as history, literature or elective. It is easily modifiable to younger grades or older grades. I gave you our schedule but we could have sped that up and completed this in half the time easily. D'Aulaires is a fascinating book and an enjoyable fantasy read. This course gave us ample time to talk about what attributes of our God the gods were created to make sense of. Overall this was an enjoyable course. ARupLife.com received product, press or compensation to facilitate this review. This post may contain affiliate links. We only give our honest opinions of products. This post is in accordance with the FTC 10 CFR, Part 255 concerning the use , endorsements or testimonials in advertising.